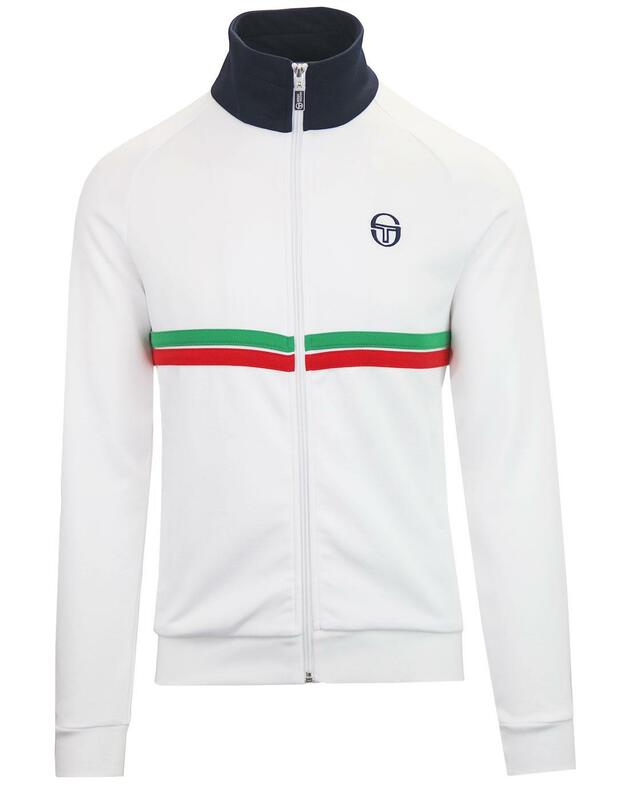 Sergio Tacchini 'Dallas' men's retro funnel neck track jacket in white. 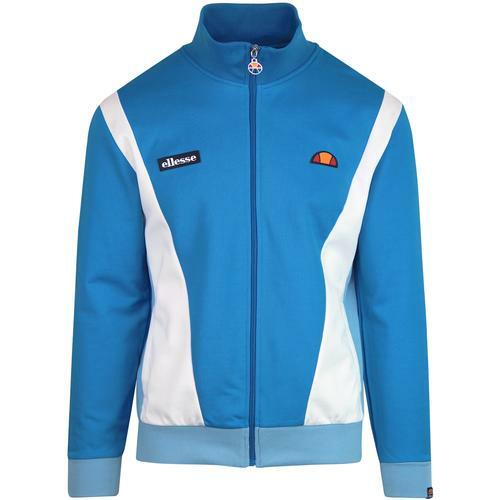 An iconic Sergio Tacchini 1980s archive jacket. The original Sergio Tacchinil 'Dallas' style was originally designed for tennis legend John McEnroe. Adopted by 80s casuals and with a definite indie Britpop flair, the 'Dallas' track top features retro cut and sew twin stripe chest detail in red and green, contrast retro funnel neck collar in navy and Sergio Tacchini signature embroidery to chest. Crafted from classic poly tricot fabric and finished with ribbed trims, side pockets and Sergio Tacchini signature embossed zipper. The Sergio Tacchini 'Dallas' men's retro track top is a timeless sportswear classic, perfect for that casuals and terrace look. - Sergio Tacchini 'Dallas' men's retro 80s funnel neck track top in white. - As worn by tennis legend John McEnroe. 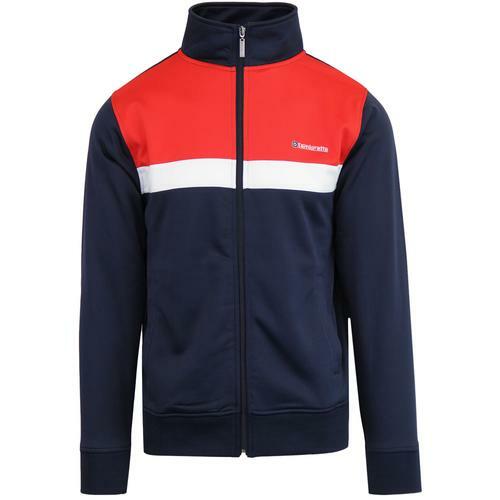 - Classic 80s Casuals styling with twin chest stripe detail in green and red. - Retro navy funnel neck collar. - Sergio Tacchini embroidery to chest. - Sergio Tacchini embossed signature zipper. 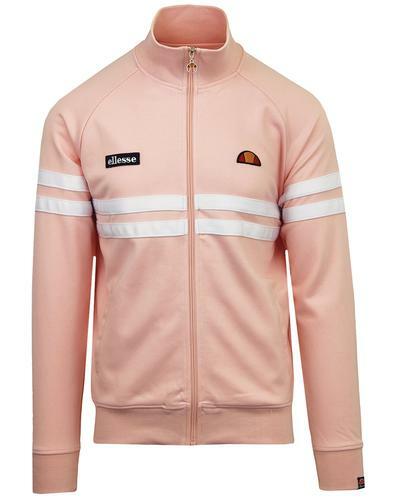 - SKU: 37570 Dallas Track Jacket. Composition: 60% polyester, 40% coton.